Today marks the 200th anniversary of the Treaty of Segauli. Whilst the Treaty of Segauli was initially signed on 02 December 1815, it was not ratified until 04 March 1816 between the King of Nepal and the Honourable East India Company (HEIC). An Anglo-Nepal War had been formally declared on 1st November 1814 following a series of incursions into HEIC lands in Northern India and attacks on police posts. There were a number of battles and engagements that took place from the end of 1814 through to the spring of 1815 by four columns of HEIC and British troops against Gurkha soldiers in strongly defended hilltop positions. These attacks and advances met with stubborn resistance and in all but one case failed to achieve the easy successes that were anticipated. 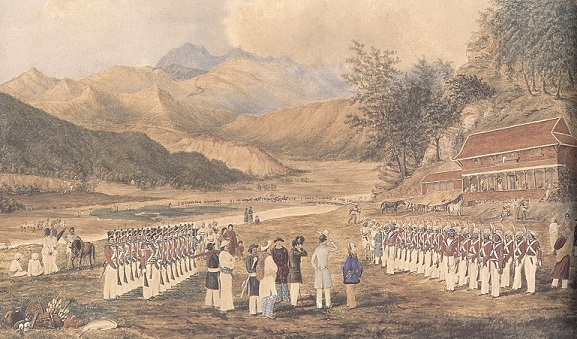 It was during this first phase in the fighting that Lieutenant Frederick Young and others first recognised the superb fighting skills of these soldiers from Nepal and formed the first Gurkha units to serve the Crown on 24th April 1815. A peace treaty was drawn up in December 1815 but not ratified. The war, not being over, a further campaign under the command of General Sir David Ochterlony was directed at the capital Kathmandu. After a number of skirmishes, the HEIC and Nepalese troops met again in battle at Makwanpur. Following this battle, the Nepalese army decided to sign the peace treaty at Segauli on 4th March 1816.